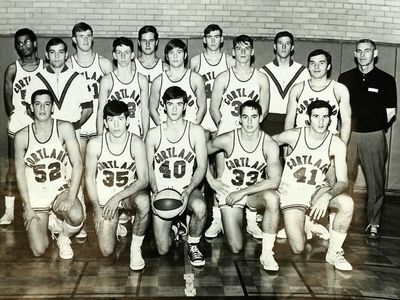 Men's freshman basketball team photograph. First row: M. Roteker, B. Husak, W. Howe, P. Diffendorfer, D. Pitonzo. Second row: P. Harrison (Assistant Coach), G. Wilkins, B. Antin, E. Thompson, J. Wahl. Third row: E. Boyd, T. Wilson, S. Girard, D. Rees, T. Hargreave (Assistant Coach), A. Grieve (Head Coach).